Unauthorized upload of copyrighted contents has become a global problem, and abusive use of UGC sites, namely video hosting services, to engage in copyright infringement has been a major issue among them in particular. 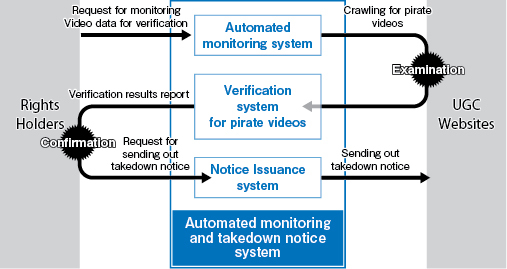 In 2009, we formed our “Automated Contents Monitoring Center” to send out takedown notices to some UGC sites in China and South Korea, using crawling technology to monitor the sites and digital fingerprinting technology to identify (verify) infringing contents. This initiative originally started as part of feasibility studies of the Ministry of Economy, Trade and industry(METI), but we have taken complete charge of it since 2012. With cooperation from Japanese rights holders, we have kept sending out takedown notices to increasingly more number of UGC site operators to remove contents that are uploaded to their sites without authorization, and we are maintaining the compliance rate of nearly 100% in this effort. "CODA Content Automatic Observation and Deletion Center," which started running as an operation test in 2011, was implemented with various technologies such as "Crawling Technology" and "Comparison Technology." The Center has achieved 99.7% deletion success so far (as of March 31, 2014).